Welcome back to Uncle Tom’s Corner. For a while I wasn’t sure you’d be able to get here because of all the snow. Then, typical of Front Range weather, the sun came out and the snow all melted so here we are on a slightly muddy country road. At least cleaning the mud off one’s boots isn’t quite as distasteful as some of the other stuff we’ve been known to step in. Bomb cyclone 2019. I was curious about the origin of that phrase so I did what any other curious individual might do…I went to the bookshelf and pulled out an encyclopedia. Just kidding…I Googled it. Bomb cyclone finds its origins in “bombogenesis” which is what happens when the central atmospheric pressure of a mid-latitude North Atlantic cyclone drops 24 millibars or more in a 24-hour span. To be honest I wouldn’t know a millibar from an oxygen bar, but I digress. And a cyclone is another name for a low pressure system that rotates counterclockwise in the northern hemisphere, and, presumably, clockwise in the southern hemisphere like the water is a flushed toilet. But I digress again. Suffice it to say there was precious little barbecuing going on during the storm. I made it home and, a reversion to my youth, my wife and I played canasta and watched the storm rage. As a result of last summer’s hail storm we (along with our insurance company) are the proud owners of a new roof so I was terribly relieved to NOT find our back yard (or the neighbor’s yard) strewn with our shingles. The only mishap, not really worth mentioning, is that my turkey fryer ended up plastered against the neighbor’s fence and buried under a snow bank. One of the real tragedies is the loss of livestock. Way back when I was a drug peddler (animal health supplies) this was my favorite time of the year…when all the little critters were being born. Watching those baby Herefords and Angus calves emerge was pretty heartwarming. And listening to the mama cows lowing to their babies…that was real love right there. Following the snow storm that hit Nebraska, the Dakotas…and seeing the farmers and ranchers gathering up wagon loads of animals that didn’t make it…heartbreaking. What isn’t under snow is under water. Any number of towns with no way in or out, bridges and roads washed away. And our spring runoff hasn’t even begun. Bomb cyclone indeed. 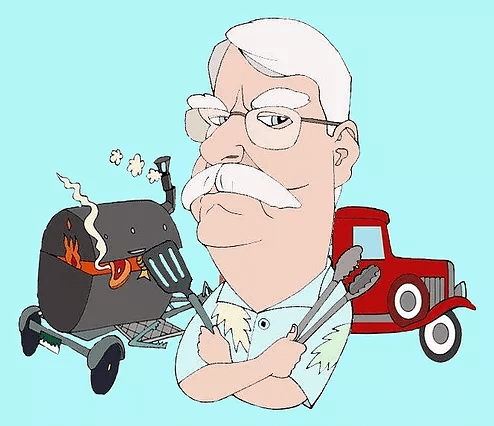 On a more upbeat note, I got notice from the 26th Annual Colorado BBQ Challenge to be held in Frisco on June 14th and 15th that I’ve been selected to judge. Is that a big deal? Not really…but it you’ve never attended it’s a bit of a kick in the keister. They block off both ends of the main drag, put a live band on either end, vendors lining both sides of the street and wall to wall people. All of that with the intoxicating aroma of barbecue wafting on the mountain breeze. The first year I judged up there I saw a competitor that billed itself as the Jamaican Barbecue Team. Not sure what kind of brisket they were smoking but it certainly didn’t smell like any kind of barbecue I was familiar with. On that note I should probably do something constructive…like rinse out the turkey fryer. Not sure if the neighbor’s dog got to it before I did or not. Ya’ll take care and I’ll see ya through the smoke.